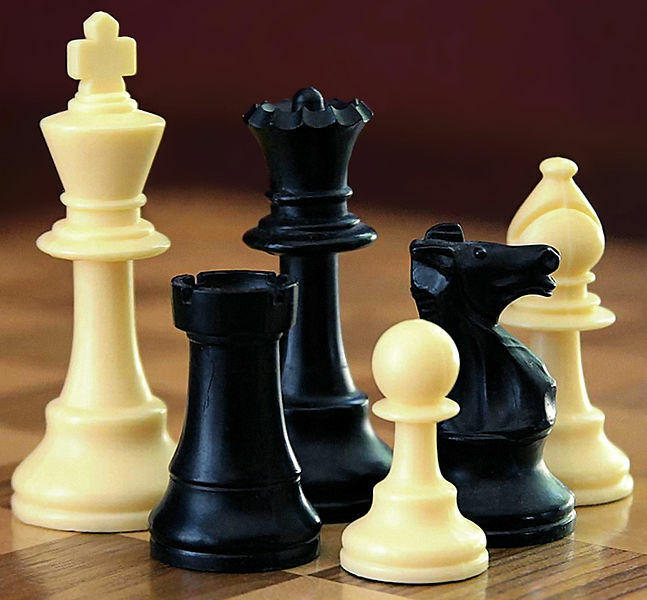 Peace and Pieces on a Chessboard. It is still two years to the elections of 2015 but the topic dominates news and conversation in Nigeria. With the announcement of the creation of the African People’s Congress in February -as a result of a merger of the major opposition political parties- there seems to be, among the political activists in the opposition, and people who are simply fed up with the current state of Nigerian affairs, a sense of expectation and confidence that the political juggernaut that is the Peopleâ€™s Democratic Party (PDP) will finally be overcome come 2015 and the nation will automatically enter the promised land. Discussions on public sector reform, the merits or otherwise of privatisation in general and of the PPP as the missed panacea to the problems of the Federal Government Unity Schools were on social media a few weeks ago. I kept away from the discussions for very private reasons. I simply made notes of my thoughts and now wish to share these. Public sector management and reform are multi-disciplinary in nature and not all about economics. The domain of public policy is about economics, the social, the political, the cultural and the emotional. Reforms that focus on one of these areas to the exclusion of others invariably fail. Public reform agents who fail to factor these diverse domains in their reform efforts and who then fail should be held accountable for loss and waste of public assets. The saying that Governments have no business in business has now become part of conventional wisdom and popular folklore. Governments are simply expected to create the right policy environment and realistic regulatory frameworks, step aside and let the invisible hands of markets drive things to perfection. For some good and services however, the allocative efficiency of markets is not optimal. We now know that markets may not always be efficient and when markets, through their operations, create negative net losses on transactions, we talk of market failure. When this happens, governments then initiate policy interventions designed to provide services which markets may have failed to deliver. Governments do this to serve the overall interest of society and to deliver certain desired outcomes. Governments may not achieve the same cost efficiencies as markets in certain areas in the delivery of services. This is because their foci are less on profits and more on social benefits. In decisions as to which route of service delivery is preferable, we must be alive to the reality of trade-offs. When Government interventions result in outcomes that are sub-optimal, we talk of government failure. Public sector reform advocates/champions should recognise the realities of both government and market failures. Confronted with the reality of government failure, the temptation is often to forget the notion of trade-offs and to immediately want to call in private service providers. But private service providers may not be best suited to provide certain goods and services. In the public realm, we can identify two main types of goods – private and public goods. Private goods have two key qualities – their consumption is rival (the consumption by one person decreases its overall availability and secondly persons can be excluded from consuming them by virtue of the fact that some money is needed to consume them. Public goods on the other hand are non-rival in their consumption. They are also non-excludable. Their consumption results in net benefits to society. This is particularly so because of three of their qualities of public goods earlier referred to – Their consumption is non-rival, their consumption is non-excludable and their consumption results in externalities. The social costs of market driven policy reforms can outweigh their economic benefits as a result of negative externalities. The invisible hand of market can also result in social exclusion and social cleavages. When such threats are perceived as real, governments intervene to reduce these negative side effects that markets can produce. Some public services are set up with objectives that go beyond the logic of penny packaging economics. I consider basic education to be a public good, though it is perhaps better to see to see it as merit good. Public and merit goods like education have huge externalities. The social rates of return of basic education are huge but private markets may defeat these by using price to exclude. Social protection interventions such as safety nets and cash transfer schemes which are then put in place to check such exclusion and mitigate their negative impacts involve – financial and transaction costs. Nearly every nation in the world has committed to Nine years free and compulsory basic education. Would privatising that component of basic education that government provided it make its delivery more effective – both in terms of costs and social benefit analysis? Would privatisation, through PPP, not impose new transaction costs? Would the argued efficiency gains cancel out such costs? Proponents of privatisation of basic services will need to answer questions such as these clearly and convincingly and with enough evidence to carry all stakeholders along. Some of the arguments and presentations I have seen provide fuzzy answers to these questions. Unprincipled privatisation can lead to disastrous outcomes. Not all goods and services can or should be privatised. We should note the realities of economies of scale in the provision of such basic services as education. Education production usually involves high production costs. Private providers in PPP ventures are only coming in because government has already met a major proportion of these high set up costs. The suggestion that government will remain the primary funder under a PPP scheme is another attraction for these investors. When fixed cost in education production is very high and the potential number of students is very low, no private firm would like to enter such a market since it’s not profitable to provide such a service. Private firms can only enter if they think they will make gains. Notice how very few private providers of education get into the education of children with visual, hearing or mental challenges! One conclusion from such observation above is that the interest of most private providers is profit! Though public provision may end up with less accountability and more inefficiency, yet sponsors of PPP will need to prove beyond reasonable doubt that private production will result in more efficiency and more accountability and that the costs of achieving these two are not hidden, will not involve huge transaction costs and will not result in negative externalities and other social costs. We must recognise that private markets are inefficient in the sense that they place their profit ahead of concerns for social equity and appropriateness. Ensuring these two are reflected in private markets usually means additional costs and quasi government in markets. The Unity Schools are not working as efficiently as they ought to but the solution to the problem does not lie in PPP. Indeed time is right now to look critically at these schools with regard to their size, numbers, spread and the degree to which they have achieved their initial objectives. Luckily, our constitution recognises private provision of education. Those who want to improve quality of education should ask such private investors to establish their own schools, provide quality services. Their schools would then become models that would challenge and inspire others to excellence. The inheriting of /taking over of/running of Federal Government assets majorly by private providers is not the way to go. Building their own schools, striving and thriving in such schools by such well-meaning private providers appear to be the most sensible route to go. These are my thoughts. I have written #42 because I hate to end a presentation on an odd numbered item. Lol! Glad to have your considered reactions. Readers may also want to read my reflections here on leading and managing change in the public service. By whom and with what? What do I believe these days? What is my purpose in the midst of hurt that so overwhelms? 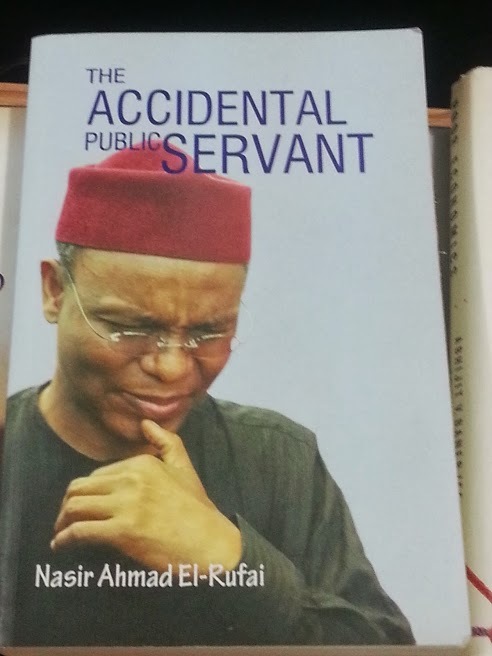 I am sharing my jottings and comments on Nasir El-Rufai’s The Accidental Public Servant. It is a very fat book broken into a number of chapters and my approach is essentially to make comments on each chapter as I read along.Since I am not privy to the inner workings and intrigues of the governments he served under, I cannot challenge the facticity of a number of the claims that El-Rufai makes in his book. I will however comment and judge the book by looking at the consistency of claims made in it and what these claims and the manner in which they are made justifiably reveal about the author, his person and his intentions. Those who have been privileged to work closely with the author have already reacted, some confirming portions of his claims, others pointing out and questioning the motives for what they see as glaring inaccuracies in the book. “Prologue – The beginning of the end”- is a blistering attack on OBJ. It was written and positioned to inflict maximum damage. It is interesting to observe the author’s fondness for taking on targets with military backgrounds. Recall he had dented GMB’s reputation by his remarks that GMB was “unelectable” and by the aspersions he cast on GMB’s integrity during his tenure as head of PTF. Then, the salvo was aimed at a General with presidential ambitions. Now he turns his guns at an ex-president anxious to retain his relevance in influencing leadership choices in Nigeria. El-Rufai’s attack on OBJ in “Prologue” effectively dents the image of the dispassionate elder national statesman that OBJ seemed anxious to cultivate at the time the book was released. As I read the Prologue, I could spot a few problems of coherence that must have escaped the attention of the author and his editors.One of these problems is the inability of the author to detect the tension that exists between a verbalised commitment to democratic principles and his tacit endorsement of succession by selection/nomination by incumbents. Another problem of coherence, this time at the level of the author’s internal logic, is his recognition of the hand of providence in leadership emergence and his seeming inability to accept and apply that same recognition to the emergence of OBJ’s successors.Yet another is his acceptance of a style of government by an inner clique and coterie of presidential favourites, of which he was a member, and his inability to recognise its inherent dangers. His tacit support for zoning is also at variance with a commitment to an ethos of leadership excellence. El-Rufai’s claim that the governments of Abubakar Tafawa Balewa, Yakubu Gowon, Murtala Mohammed and Mohammadu Buhari(identified by him as northern led) as least corrupt and most inclusive can be easily faulted. His exclusion of the Ironsi regime from this his honour’s roll also raises concerns as to his real and underlying intentions! Is El-Rufai here not guilty of the same selective amnesia and ethnic irredentism that he conveniently accuses the Nigerian power elite of? El-Rufai’s argument of southerners being always in number two position in successive federal administrations tries to avoid the truth of power in Nigeria. Number one is everything. The number two position in our current political dispensation is not a very weighty one, and NER knows this! The fact that he knows this and still tries to hoodwink us is enough to start doubting his value as a reliable witness and commentator on Nigerian politics. El-Rufai further informs us in Prologue that any northern politician who supported OBJ’s unfortunate third term bid would have had his property burnt – is this realism, insider knowledge or simply a tacit endorsement of violence as a form of political expression? El-Rufai is at pains to show himself as a man of honour but yet he stays on with a president that was clearly flirting with dishonour. How honourable is this? He opposes the third term bid but stays on. But some of his colleagues and members of the coterie who also stay on, he wants us to believe, are less principled. NOI caves under pressure though his passive construction that “Ngozi and the rest were persuaded” is convenient as he uses it to conceal either the agent or the uncertainty of his claim! He uses the overt argument of the need to continue and complete the task on hand plus the covert one of his indispensability to justify staying and hanging on to the power and privileges that belonging to this inner circle conferred on him! Was El-Rufai an “honourable” minister when he stayed on but kept undercutting his boss instead of resigning? Listen to El-Rufai – “The third term period was one in which the trajectory of our administration changed for the worse”. And again he says “Corruption at the highest level became more overt, impunity escalated, compromise with unscrupulous politicians became the order of the day.” And yet he stayed on. Where is honour here? Where is principle? In Prologue, El-Rufai also informs the reader that he is not “fooled by religious and ethnic bigots who one day are sworn enemies, only to become cooperating looters the next day”! Hear! When one reads this statement in the context of his ethnic driven apologist position on the Boko Haram terror campaign and his signing up the CPC on leaving the PDP, one can immediately begin to gauge the sincerity of this gentleman. Chapter 1 of TAPS titled “Humble origins” provides useful insights into the person of El-Rufai and enables us to understand why he poured sand-sand into OBJ’s garri in Prologue! Chapter 2 documents the early days of work after NYSC. It tells the reader of the people he met, his marriage, his foray into private practice. We also get to meet his nuclear family.We get to learn of the Barewa connection and though the author restrains himself from owning up, this connection underlay a number of his early contracts and progress. What this chapter brings out, albeit by inadvertence, is the role of cronyism in the rise of El-Rufai. This cronyism is not accidental.The author sees nothing wrong with such cronyism when it favours him.This chapter is sodden with self-glorification and narcissism – Mr El-Rufai is so caught up with himself, so great is his self-obsession that he is happily and blissfully unaware that he is displaying these traits. He is so immodest in his praise of his children and wants you to believe that these are super-intelligent creatures. 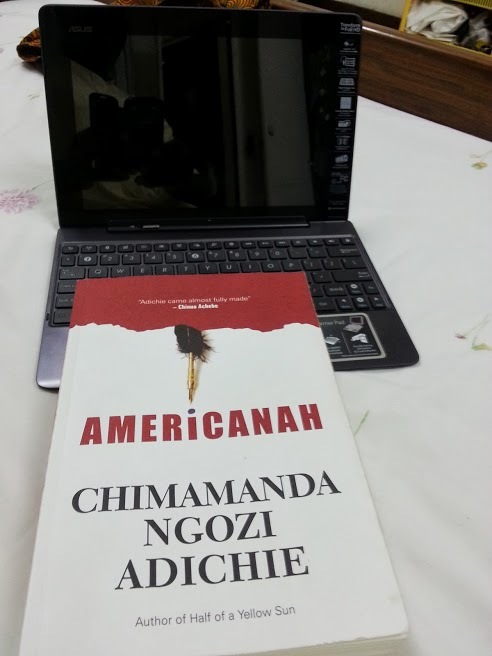 Chapter 3 “From Abacha to Obasanjo – The author presents the reader with a series of arranged “accidents” that account for his rise to national prominence with each presentation maintaining the same pattern of self-glorification but now made even more exciting by the frequent attempts to elevate guesswork to the level of fact. See Pages 53-55 and observe the copious use of “may have/must have”. El-Rufai’s vanity and immodesty continue to be sketched in the boldest of brushes in this chapter and his attempts to make a case that his foray into public service is an accident are most unconvincing. His public service career is the result of cronyism, as man-know-man and deft flirtations with the rich, mighty and influencers in addition to his own talents were the critical success factors that launched him. Even as a member of PIMCO, El-Rufai tries to spin that he was also critical in determining some critical ministerial positions in Nigeria. In the end, this type vain self-glorification becomes almost nauseating. In this chapter, El-Rufai tries to use his experiences to reflect on leadership and succession planning in Nigeria, but even here he is unable to contain his bitterness towards some people, especially OBJ, Yar’Adua and GEJ (See 57-59). His bitterness against and criticism of OBJ are obsessive and he accuses him of being rooted in the past (p.63) and domineering. El-Rufai is however unable to deny the man’s qualities of assiduity, attention to detail and willingness/quickness to learn. In doing his best to insult and tarnish OBJ, NER betrays considerable petulance which he sadly mistakes for bravery plus unrestrained insolence which he takes as a sign of courage. Unfortunately, he comes across as petty in these efforts.One comes away from this chapter recognising a scheming and ambitious mind who had perfected the act of self-positioning and who was willing to use every connectionto advance his ever enlarging ambitions. Clever name dropping is effectively exploited in this chapter to build credibility, over awe and thus sweep the reader along. When he controls his tendencies for self-glorification, he succeeds in making some useful points. For instance, he makes a good point on page 70 when he argues the benefits of a new public management approach (NPM) to public sector governance. I agree completely with him as NPM has been shown since the 1990s to have very positive spin-offs on governance and on the provision of basic social services once social safety nets are provided to mitigate any negative impacts which its market leanings may cause. Chapters 4 and 5 continue this pattern of self-glorification, disguised smear and outright destruction of persons who the author does not like using the author’s successes in the BPE as the backdrop. Here, the author is on surer grounds as there are evidences for the successes of the BPE under his watch. These successes include the successful privatisation of a number of institutions belonging to the federal government during his stint as DG of the BPE. The narrative is so structured that El-Rufai emerges as the saint, the builder, the brave visionary, the fellow who does not give a personal damn and someone whose honesty, altruism, vision and astuteness are so outstanding that they blind others who are simply made to pale into insignificance. Indeed much of chapter 5(see 92-97, 111-112 and 114 for example) are nothing but a cleverly packaged stretch of self-praise. Self-glorification is the main focus of this particular chapter where accounts of demonstrable success are padded with loads of self-hype. So great is this hyping that parts of this chapter read like efforts at self-canonization. The self-glorification goes hand in hand with searing attacks on others. No one is safe in this well-orchestrated attack on persons – traditional rulers, Mike Adenuga, Goan, Sadiq, Peter Okocha, politicians, members of the house, Abdul, Charles Osuji, etc. His account of the saga of the privatisation of NITEL is intriguing but deeply disturbing. First, BPE became the sole shareholder of NITEL, then the Board of NITEL which he describes as made of up political appointees is dissolved, thus paving the way for Mr El-Rufai as Director of BPE to acquire considerable powers to shape developments in any efforts to privatise it! The first attempt to privatise falls through because the winners failed to pay up the balance 90% of the funds within the specified time and Mr. El Rufai tells us of the steps he took to ensure that the company would not be able to recover their deposit. He then tells the reader that “NITEL privatisation did not succeed as well as the deregulation path” (p120) but fails to tell us more. There is no mention of PENTASCOPE, and for a man with such a capacity for recall and detailed narration, this is not an accidental omission. He then quickly shifts on page 122 to procurement for NITEL GSM equipment, and uses this account to further savage Atiku and OBJ. From his accounts, Motorola put in the lowest bid but the contract was eventually awarded to Ericsson at Motorola’s bid price, a decision that was clearly wrong and inappropriate. We are told that this decision caused quite some political ripples. But what is equally intriguing is El-Rufai’s disclosure (page 124) that someone hired by Motorola to investigate why the company had lost the contract informed him (El-Rufai) that OBJ had let out that the decision in favour of Ericsson was influenced by Atiku who had gossiped to OBJ that El-Rufai had worked for Motorola before his BPE assignment and that El-Rufai’s brother Bashir also owned some Motorola common stock in the USA. We are also told that Ericsson actually bribed Atiku with $3 million USD as contribution towards PDP’s 2003 campaign coffers! These are ugly revelations, which, if they are true, damage both Atiku and OBJ considerably. And herein lies one recurring weakness of the book – the selective use of detailed accounts to damage people when it suits the author and the retreat to parsimonious and hazy accounts when it suits his agenda of presenting a Mr. Clean-guy image of himself. The use of the probable and a nuanced style of concealed guesswork get to near perfection in these pages so that uncertainty and conjecture are packaged as truth and the author’s imaginations are made to be appear as both plausible and probable reality. As one reads, one gets the impression that he often converts the outputs from what is clearly a creative imagination to incontrovertible facts. See “some reportedly took early retirement” for example on p.84 and note the use of reportedly! The “Atiku wars” start off in these two chapters and El-Rufai slowly but persistently tries to present Atiku as a sly crook and an untrustworthy person. Never mind if El-Rufai’s narrative reveals fundamental inconsistencies in this effort. He however is unaware of these inconsistencies in his attacks.He also resumes his gnawing away at OBJ whom he hates and loves at the same time. He loves, because OBJ is his ladder to social ascent; he hates him because he sees OBJ as also blocking his chances. In some episodes, he sells OBJ to the reader as a gossip who meddles! He also continues to demonstrate evidence of this wonderful ability for detailed dialogue recall which should entitle him for a place in the hall of fame for persons with such exceptional talent. Chapter 6 “The enemy of my enemy is my friend – unless the friend is El-Rufai” narrates the author’s nomination by General Obasanjo and the travails he endures to get through screening by Senate. He presents Senate as made up largely of a group of corrupt individuals who are asking for a bribe of N54 million as a condition to approve his nomination. Senators Mantu and Zwingina are closely x-rayed as representative of that corrupt legislature, the author as the no-nonsense corruption-free and morally upright public servant. Two other characters are presented in interesting manners – Obasanjo, sometimes as the conniving, cunning, shrewd and scheming president, at another time the indifferent political onlooker and Atiku as the father of all unethical dealings and sleaze. He informs the reader that Atiku eventually paid the bribe that allowed his nomination to sail through but fails to inform us why He as Mr Clean, armed with such knowledge, still hung on to a post that was got through stained hands and corrupt dealings! The tendency to present guess work and pass them off to the reader as confirmed facts persists in this chapter. His account of IBB’s involvement in “the dethrone OBJ plot” – “IBB allegedly kept calling Obasanjo” and of OBJ kneeling down to beg Atiku (p151)are good examples where conjectures and guess work are elevated to the status of facts! Another interesting aspect of this chapter is the failure by the author to fully appreciate the full value of the disclosures he lets the reader into. This is especially so when he sets about narrating his dealings with Atiku to foreclose a second term for OBJ (pp144-150) even to the point of going along with Atiku on the assumption that the prophecy of OBJ’s death by a marabout would come to pass. He tries to excuse his going along with Atiku by saying “After Atiku shared this momentous prediction with me, what could I do? My hands were effectively tied from taking any immediate action” (p146). Who tied his hands? Mr El-Rufai does not tell us. I suspect some unintended personification of vaulting ambition here as the culpable agent that tied Mr El-Rufai’s hands! What the author and his editors failed to pick up was that whereas this chapter was written to present El-Rufai as a man of great influence, they unwittingly ended up presenting him as a man without scruples, a bold and ambitious man for whom moral niceties could be thrown overboard to advance the realisation of a quest for power. There is nothing accidental in all he did in this chapter, the choice for acts that border on duplicity does not come by accident but are driven by intentions and inner longings of a soul seduced by the lure of power. El-Rufai’s commentary on zoning on page 150 falls flat on its face since his first emergence on the political scene through PIMCO, is in a large way, attributable to that same zoning but this is our man who is sleek and an expert in running with the hare and hunting the with the dogs! Chapter 7 “The Economic Team – Key Players is an x-ray of a core group persons whose decisions informed and shaped economic policy in OBJ second term. The x-ray machine is vested in Mallam El-Rufai piercing gaze and retold in detailed recollection thanks to this electronic magnetic memory that Mr El-Rufai possesses, a memory so acute that it recollects words spoken to their exact detail. The X-ray seeks to be neutral and objective but ever too often we find the person of the author intruding and thus damaging the efficacy of the shots and on the reliability of the accounts. The accounts are also so Rufai-centric that a good sub-title for this chapter ought to be “A salute to vanity”. Every strategic appointment to this core team or decisiontaken by it either owes to his wonderful intervention, or his nomination or emerged after prior consultations with Mr El-Rufai to the point that one begins to feel that at a certain point in the OBJ administration, Mallam El-Rufai actually hijacked the whole machinery of governance at the federal level after having OBJ subjugated and dazzled by his wit, intelligence and political wizardry. As one has no reason to doubt the veracity of these accounts, on can then only feel sorry that we had such a lame president who allowed himself to come under the total control of one his ministers. Read this and marvel at power, arrogance and vanity! “I got many people into government in that manner once he began trusting my judgment as well” (p. 160). Nuhu addresses him as “Yallabai” (an appellation that conveys deep respect among the Fulanis), his singular act of unapproved financial largesse of N100 million was key in getting the EFCC off the ground, his intervention with OBJ’s chief of staff in the end is the critical element that allowed Nuhu to walk around obstacles created by rank, it was El-Rufai who suggested that EFCC should be on economic reform team, a membership El-Rufai is at pains to tell us is partly responsible for Nuhu’s enhanced status (p.169). Ngozi Okonjo Iweala’s post as Minister of Finance was the result of a suggestion by El-Rufai to Baroness Chalker (p. 172). It was El-Rufai who stabilised Nenadi in her post as Minister of State for Finance (p176) . All of us Nigerians must owe a lot to this political genius. And because of this huge debt of gratitude, we must also be willing to forgive this genius some inconsistencies in his narration. Take his two accounts of his appointment to the post of minister of the FCT (p132 versus p175). Are these consistent? Which account is the reader to believe? Is there some editing glitch? I am inclined to believe this – geniuses are human and humans make mistakes and this self-promoting genius can therefore be forgiven mistakes. The description of the economic team is actually an excuse to smear and damage members of the team he does not like –Nuhu “who is willing to dine with the devil to get power no matter the cost, and when one gets to power it could be used to right things” (p.194) (note the use of “could” with its suggestion of doubt); NOI, a realistic student of power and (who) wanted to be on the side of the powerful – the winning side all the time” (p175); Soludo who got close to the president through a strategy of ingratiating himself to OBJ, who with NOI craved the limelight (p190), a man with long-term political agenda, “unlike most of us, who were content to just get the job done” (p192). The whole of this chapter reads like a series of smears and snide remarks on persons on the core team, and since one does not know the motivation and cannot doubt the veracity of El-Rufai’s account, the reader must agree that these persons are as he has described them. He is unrelenting in his “tear and smear” campaign with these people. He even takes swipes at NOI’s integrity by pointing out that her brothers were making deals with the Ministry of Finance she headed (something which is in clear violation of conflict interest principles). The only person who comes out clean is Dr. Oby Ezekwesili, who from the accounts of her in the book, is a candidate for immediate beatification – fearless, direct and blunt and someone who could give OBJ well deserved tongue lashings when he stepped out of line(see p185 for a sample). Chapter 8 describes the author’s assumption of duty as minister for the FCT. The title – Abuja – the economic reform laboratory is misleading since we see very little of economic reform activities going on in this chapter except if we were to broaden the economic reform broadly to include actions to demolish illegal structures and restore the city to conform to its master plan. This is about the most informative and technically neutral chapter so far except in those cases when the author’s tendency towards boastfulness acts up and intrudes on the objectivity of the narrative. The author narrates the steps he took to revamp the ministry he inherited, his efforts to empower his staff and give voice to hard working colleagues (very commendable), his work processes and some of his major achievements and these are no mean ones too. He goes to great length to paint a picture of his courage, professional integrity and sense of fair play in the management of the bids for the Abuja water supply project. This also provides a good opportunity to take a swipe at Atiku who he presents once again as a corrupt wheeling and dealing politician. His unabashed confirmation of his discretionary powers in land allocation: “As minister, I was solely in control of land in the FCT and I could allocate it more or less on discretionary basis” (p236) leaves one baffled but also makes understandable whatever abuses of office which this concentration of absolute power in the hands of a minister may have brought about. Chapters 9-11 continue this detailed presentation of his actions as MFCT, and some of his achievements deserve praise, especially the establishment of GIS for the FCT. Some sentences jolt the reader – “It helped that I was not a politician as such” (p204). What does this mean?His boastfulness is loud and immodest – churches and mosques are praying for his downfall but to no avail (p212). Pages 197-299 are one long stretch of self-praise and author-organised public trial and acquittal before the jury of imagined readers overwhelmed by the copious data he avails us. In trying to project himself as good and saintly, he takes carefully packaged swipes at his predecessors in office who through either negligence or connivance had converted Abuja into a haven of land speculation. On page 252, he informs the reader that he even revoked an allocation made to him by Mamman Kontagora. Indeed pp 197-299 read more like justifications the actions he took as minister and one is happy finally to find on p260 an admission of fallibility by this great son of Nigeria who struggles to cast himself as larger than life – “As humans, we must have made mistakes”. His use of words is also very revealing, especially of his attitude to others, including even the president. Listen to this “I was incensed and responded in writing…” p265. He was referring to the president as the person who caused this offense he was reacting to! His narration of his dealings with Justice Sambo and Chief Igweh of Bolingo Hotels is meant to present him as a man of principle, but despite his best efforts, one detects a large amount spite and bitterness in his motivation. The habit of claiming credit for all positives also continues, and an undiscerning reader will leave the pages feeling that is El-Rufai is a one man squad on a mission to sanitise Nigeria – a man of truth. But then this Mr. El-Rufai is selective with some of his truths and economical with some – and it is amazing how he concludes 102 pages on land reforms, demolitions and land grabs in the FCT Abuja without any mention of the contentious conflict of interest laden generous allocations to members of his family that has now become a prominent hit on the story and landscape of public corruption and abuse of office in Nigeria. (I later discovered reading further that he touches on this but very sketchily and economically too, on p 380. – NER is indeed clever and knows when to be economical with the truth!) What is then most intriguing in all the accounts in TAPS is that detail and that event which are either deliberately left out or hastily glossed over, and there are quite a lot of such but such events will simply not go away, cannot be wished away and cannot be dealt with by ignoring them as they have made their ways into the unofficial history of governance and abuse of office in Nigeria. Chapter 13 deals with reforming the public service and again, it is all El-Rufai, the knight in shining armour charging at the bastions of a corrupt and ineffective public service after as he lets us know, he had successfully cleaned up the stinking FCT stables! His grab for power through stealth and positioning eventually pays off and he tells his reader that: “The proposal to change the reporting relationship such that the Bureau of Public Service Reform reported to the Economic Team through me was approved” (p322). How could a man who claimed he wanted to reform the public service do a thing like that? He then proceeds to take broad swipes at the civil service (p323) but his analysis of the malaise in the civil service is not deep or honest enough for where it were, he would have realised that two things “killed” the civil service – years of constant meddling by the military and the quota system where unqualified persons from certain sections of the country were appointed to posts in the public service that they were ill-suited for. Chapter 14 is on the third term bid and completes the damage he sought to inflict on OBJ’s personality and history’s judgment of him. He casts OBJ in a very poor light as an ambitious scheming person but overlooks that what he also describes is his own immense capacity (El-Rufai’s) for duplicity and guerrilla warfare (p332, 334, 339). He also savages Anenih, Atiku and a few others and is clearly exultant and triumphant that the third term bid failed. His efforts in the closing page of this chapter to offer a fig leaf to OBJ strikes me as the height of hypocrisy and his hint that his problems with Yar’Adua may have been instigated by OBJ is disingenuous and malicious. His missions to northern leadership to torpedo the third term bid also suggest that his interests and motivations on this are not national but regional and personal. Chapter 15 is a scorching attack on Umaru Yar’Adua. It is a chapter sodden with bitterness, spite and pettiness. He ridicules Yar’Adua, tells us that he drank all the time (this from hearsay) and even cannot resist mocking him for his debilitating skin disease – “some kind of eczema” He goes as far to tell us that Yar’Adua is “untidy, dirty even, rarely bathing and never caring to dress neatly” (p369). If this type of presentation of a late president is not the hallmark of pettiness, someone should please us what is. The onslaught is unrelenting –Yar’Adua was incompetent (p355), insecure, irrational and intolerant of divergent views (370-371) and unwilling to surround himself with competent persons (please read to mean first and foremost El-Rufai) and yet we are also told that the same Yar’Adua tried without success to draw him in. His bitterness over being by-passed is so obvious and his inability to forgive OBJ for this infraction is so great that he even tells us that OBJ skin changed colour to sallow at “the final breakfast”, the last sub-heading being either an unfortunate attempt to imitate the title of a revered Christian event or an unsuccessful gallow’s joke. We are told that OBJ was uncomfortable with him for his independent mind – “hated my independence of thought” (page 367) but loved the fact El-Rufai always got things done! His revelation of the shady Transcorp deal (p363), a deal where we told that OBJ and of Ministers made kills using insider information to purchase and later sell off their shares coupled with details on fund raising for the OBJ library were huge last efforts to take whatever he had not yet excoriated and lacerated in OBJ’s reputation to the cleaners after accusing him of being capable of shuttling between graciousness and vengefulness “exacting retribution” in a matter of seconds (page 368). All these revelations of the dirty dealings of an inner core are only coming out because “things fell apart” between OBJ and the man he, more than any other person, made. His lament over the fact that his post as de facto VP and the fact that all the clout that he had developed by successfully cornering much of executive power from an indulgent president was about to evaporate now that he had been by-passed is so loud in this chapter and the suggestion that his colleagues in the cabinet were jealous of him is the worst form of insult to one’s colleagues (p366). Reading this page is like reading the lament of a power hungry politician faced with the imminence of loss of power in a political environment that was about to change and whosedirection of change were unpredictable and could indeed be hostile to his ambitions. We learn that it was Nuhu, described unflatteringly as delusional, who was the one actually pushing El-Rufai to go for the presidency and that it was this what partly got the author in trouble with Yar’Adua through an act which if true borders on indiscretion, recklessness and childishness (p 358-360). This picture he seeks to paint of Nuhu here does not agree with the picture he had earlier painted of Nuhu (see p 155-196, particularly p194). This is also the chapter where he tries to shrug off charges of abuse of office and conflict of interest in land allocation as minister of FCT but the effort is not very convincing (p380) – How many plots were allocated to members of family? El-Rufai does not tell us precisely except to trade on vagueness – “the number of plots allocated to my extended family members had come down to less than eight out of more than the 27,000 plot allocations I approved during my tenure” p380. Here El-Rufai fails himself, since for a man who shouts claims of personal integrity from every available roof top (p 378) and who is so good with numbers, precision in details should have been of the essence! The rest of the book Ch16 (Exile), 17 Five years of invaluable experience, the epilogue and the Afterword continue the same pattern of self-presentation, self-praise and attack on his political enemies in which the author constantly reveals the arrogance, vanity and bitterness that drive him. It is not that he is not aware that his presentation and attitude in the book could be read as unbridled display of vanity and arrogance but as he tells us on p485: “I am really not sensitive to people not liking me”. Exile is not really Exile but an excuse to deal what he believes to be another death blow on OBJ in the subsections titled “ the politics and ethics of statecraft” and “ the theory of second comings’. The rest of that chapter describes his fight to death with Yar’Adua, a fight in which all gloves come off and the author reveals how dirty he can fight and inadvertently also reveals the porosity, conflicted loyalties and unprofessionalism in the public service such that he could have access to government documents even when he had left government. This last part of the book also describes his efforts at getting back into politics, travails whilst abroad especially concerning his passport renewal, his very deliberate smear of Yar’Adua, something he relished and described on page 404 – Umaru drinking beer, gin and whiskey, smoking marijuana, too shy to talk to girls, Umaru’s failed second marriage, Umaru never having worked a day in his life, Umaru the sponge who lived off his elder brother, Umaru the free thinker who believed in maraboutsetc details that nauseate even the most insensitive of persons by their pettiness and which also reveal the pettiness of the writer. The section also narrates Umaru’s failing health and the behind the scenes efforts to get a replacement for him should something go wrong, a section he uses to portray and ridicule Turai’s political ambitions. Any pretence that the writer is a public service, accidental or planned, should long have disappeared at this point in the book but he clings on to this claim and wants his reader to also believe him. In the section titled “Five years of invaluable experience”, the author describes his engagement in opposition politics, his reconciliation with GMB after their highly publicised spat. At this point, the author has perfected the art of concealment in his narrative style. Read page 450 and you will find no reference to the damaging remarks on GMB that was credited to him. All we are told is that “Muyiwa Adekeye was accordingly tasked to issue a similar response which was widely published in the media”. In the pages that follow, we learn of the political moves of some Nigerian politicians, moves almost dizzying by their speed and unpredictability. We notice attacks on the PDP and on GEJ. We are presented with a feel good version of the author’s parting of ways with PDP, a parting of ways where the author struggles to persuade the reader that he never really belonged to the PDP, never mind that he carried a membership card. Read this and marvel at El-Rufai’s capacity for moral acrobatics and somersaults. “Except for the one required for my ministerial screening documents, I had never really held a party membership card or been a registered member of any ward branch of the PDP, so there was nothing else to do other than walk away” (p 451). An insensitive part of this section is the writer’s effort to present the post-election violence of 2011 as spontaneous whilst forgetting that that just a few paragraphs earlier, he had said that one of the candidates had indicated that he would not take his complaints to a court if he lost! (p 466). The collapse of the alliance of the opposition, an alliance that is driven largely by the need to get the PDP out of office and not by any sense of ideological unity is described and the blame for the collapse is put sometimes on Nuhu, some other time on OBJ and some other time on the leadership of the ACN. TAPS is quite intriguing as a book. It combines narrative techniques of “blending”, “bending” & “blunting” in its portrayal of events and persons! By “Blending”, I mean a tendency to mix actual happenings with imagined happenings and to present the emergent brew as real. By “Bending”, I refer to a tendency to “panel beat”, “body fill”, photoshop and massage accounts of events to project the author. By “Blunting”, I mean the technique of bashing, minimising and trivialising any contributions by persons the author does not like. Mr El-Rufai presents what is clearly a very consistent narrative, a narrative that is consistent with his person and over-riding political ambitions. I see this book not as a recounting of experiences in the public service but as political tract spun to launch a quest for election to political office. There is nothing wrong with such a quest but there is definitely everything wrong with writing a book which is an assemblage of exaggerated facts, spite driven distortions and ambition fuelled concoctions and trying to befuddle the reader to believe that its contents were all true. There is also nothing wrong with autobiographies/memoirs – a lot of people with political office in sight have written such in the past but most of these people have written with a quest of truth and accuracy as their watch words and consistency as their overriding principle. In a way, this content and style of this book will not disappoint those who have come to know the real El-Rufai. They confirm and conform to the image and brand of the El-Rufai one meets on social media – shifty, self-obsessed, controlling, manipulative, shrewd and willing to sacrifice people, including associates to move along. (Incidentally, his reaction to the unfortunate JESUS joke by one of his ardent followers on Twitter but whom he conveniently sacrificed as the crisis warmed up is very revealing and in keeping with his character). A blend of truths, half-truths and tripe. An unbalanced mixture of fact and fiction put together to photo-shop the author and pulverise his political opponents. An immoral book spiced with selective facts written by an amoral Machiavellian.